Once per game, Hua Tuo can discard one of each suit to resurrect one player. 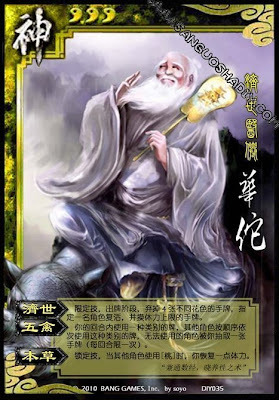 Once per turn, when Hua Tuo uses one kind of card, everyone else must use the same type of card or he takes a hand card. Whenever any other player uses a peach, Hua Tuo recovers one blood. When Hua Tuo brings a player back from the dead, they have full blood and as many hand cards as they have blood. Their role card remains face up. Although that player is alive, they are considered dead and do not need to be killed by the other team again. Whenever Hua Tuo uses "Five Birds", everyone else must also use a tool, basic, or equipment card. All these cards will take effect after Hua Tuo uses his card.